There is hardly a day in this country when the thought doesn’t cross my mind that it will be a tough place to leave, and that was particularly so when I was leaving the massive landscapes and wide-open spaces of the desert Outback. In such vast spaces any little thing – a tuneful bird, a colorful flower, an unexpected encounter with a ‘roo, camel or even a rabbit – feels like a big deal and so different from city life, where so much goes on unnoticed. 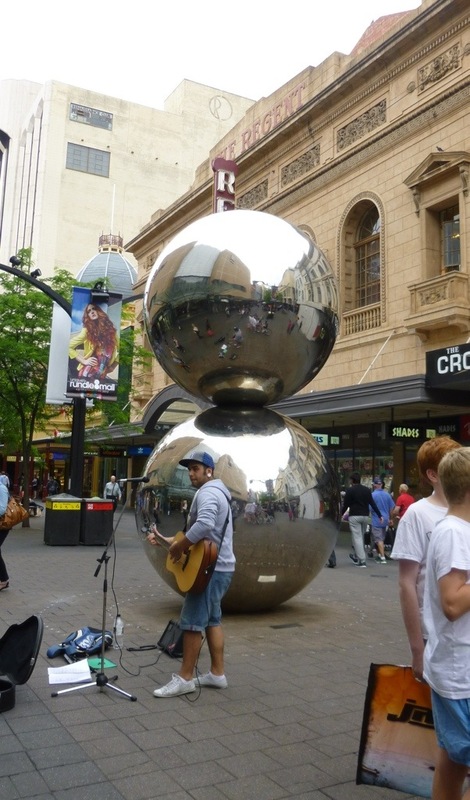 The culture shock of being back in even a small city like Adelaide was significant. I confess to spending at least a couple of days pining for the Outback. 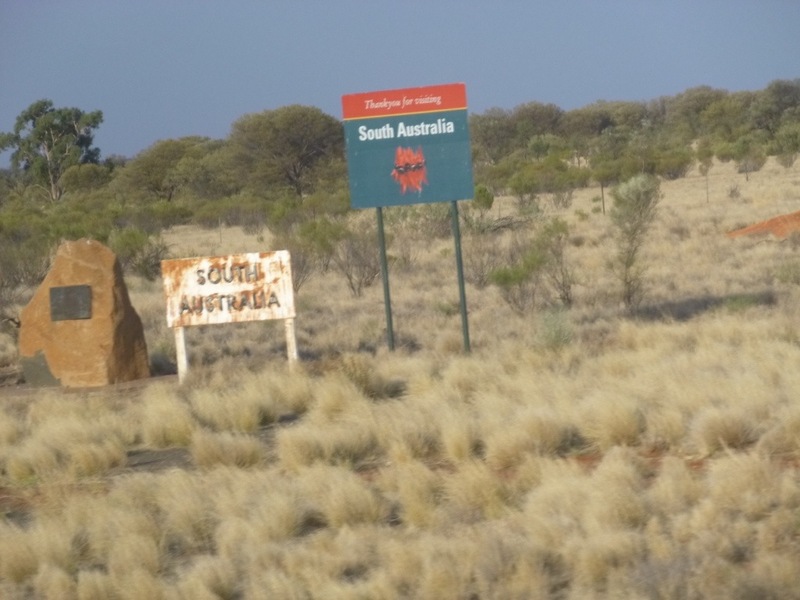 But the next adventure awaited so I was back on The Ghan – just as much fun as the first time – for the trip south out of red, flat Northern Territory to South Australia and the lush, green southern coast. 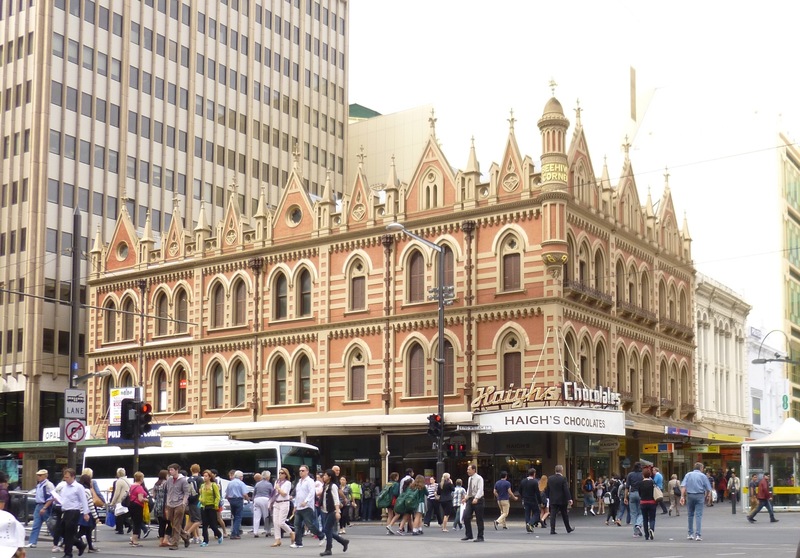 Adelaide is considered the ‘most livable city’ in Australia (although folks from Sydney or Melbourne will tell you it’s not a city – it’s a town) and it’s easy to see why, as it’s a place that seems to have it all. 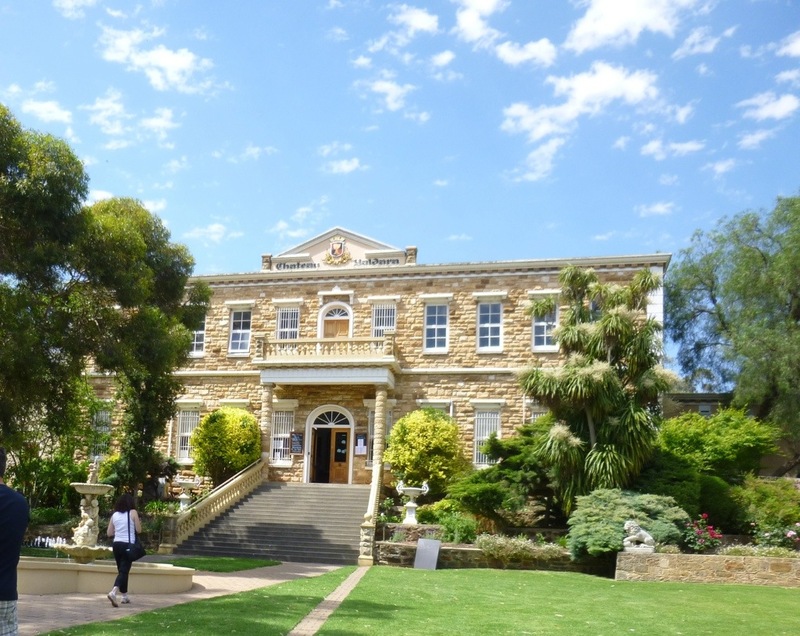 A beautifully laid out city of about a million along the meandering River Torrens, Adelaide has the gorgeous Adelaide Hills in one direction and the lovely beaches of the southern coast in the other. It’s also home to some of my favorite things. Haigh’s Chocolates are made here, also Cooper’s Ale. 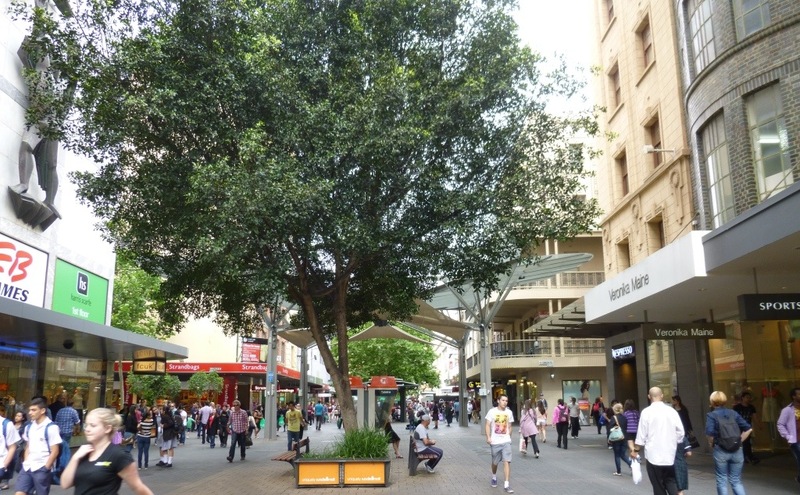 I’ve heard Australia described as ‘sort of like Canada, only with good weather’ and that’s illustrated by the wonderful outdoor shopping malls that are a common feature of every place I’ve visited so far. I really enjoyed strolling the wide, tree-lined boulevards and plazas and much prefer it to the massive in-door malls and underground concourses at home. 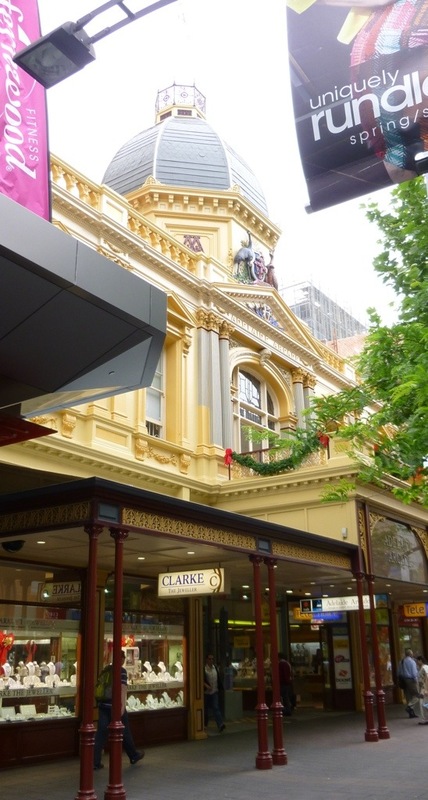 While Adelaide has it’s own CBD (commercial business district – everything here is abbreviated or ginned down to an acronym) with a few blocks of high rises, buildings in most of the other areas are low rise and they have done a marvelous job of preserving beautiful old buildings to create an attractive and eccentric blend with the new. 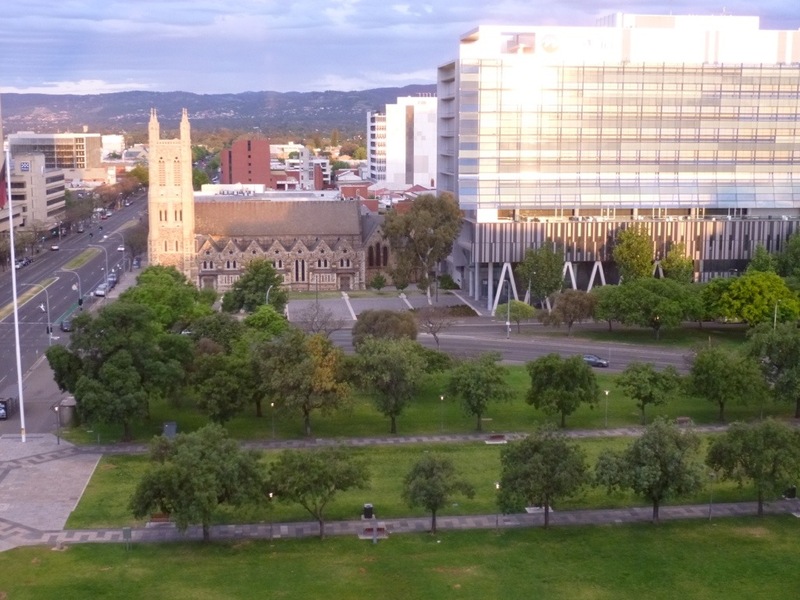 Adelaide boasts that it is one of the most logically planned cities in the country, and it’s true that it’s a very easy city to get around in. Mostly. 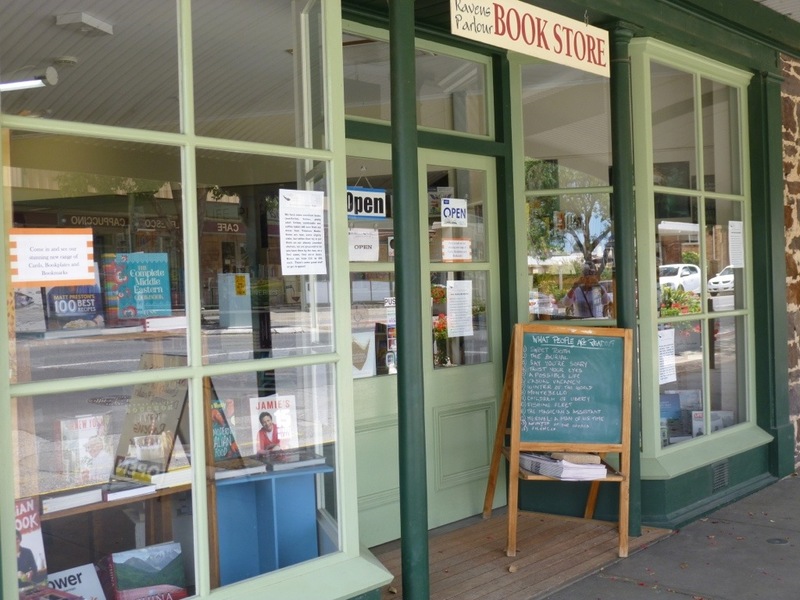 King William is the main street bisecting the city but the many streets that run off of it are called one thing on one side the the street, and something else on the other. This came about because of some long-obsolete edict stating that no street could be permitted to ‘cross a royal road’ – in this case, King William. 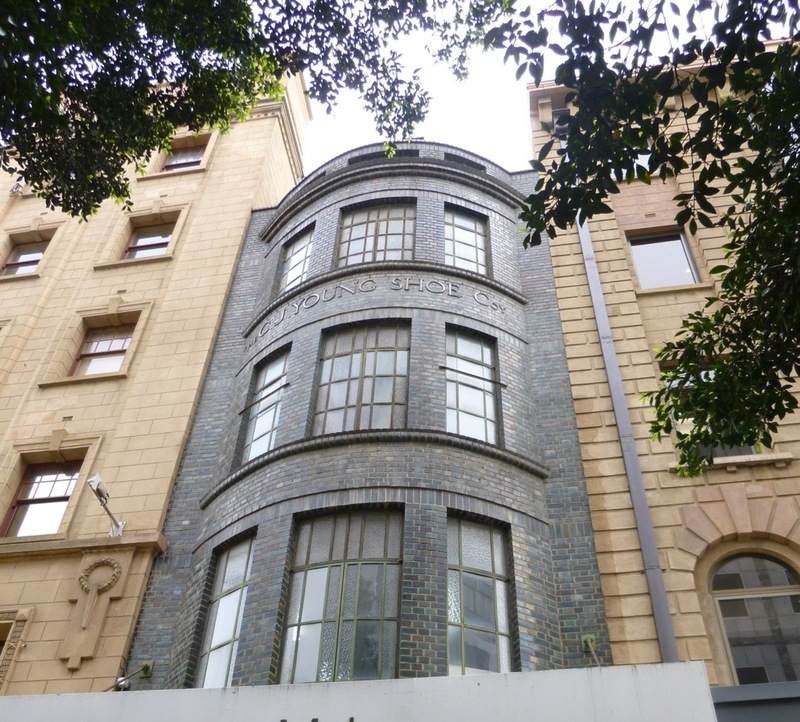 Those clever Adelaidites got around the edict by having all streets end at King William and become an entirely different street on the other side. The city is dotted with lots of open spaces. 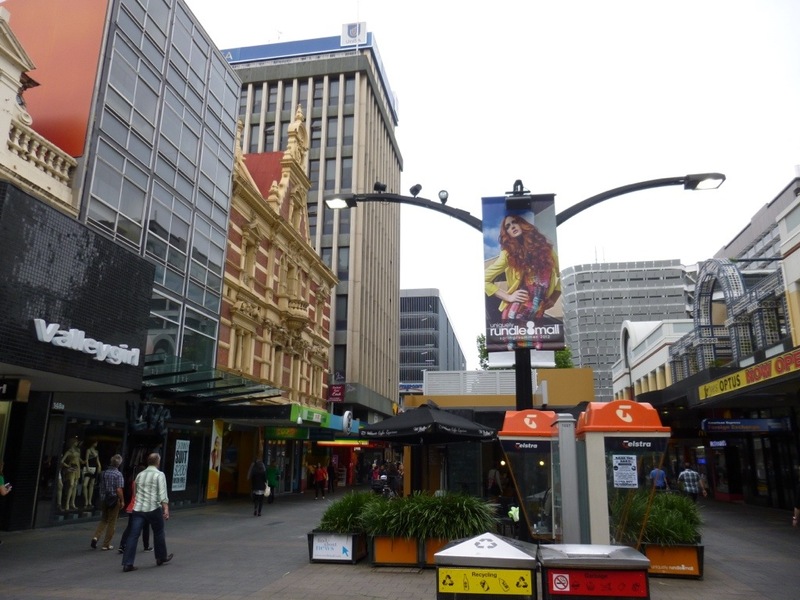 Victoria Square is the center of the city. 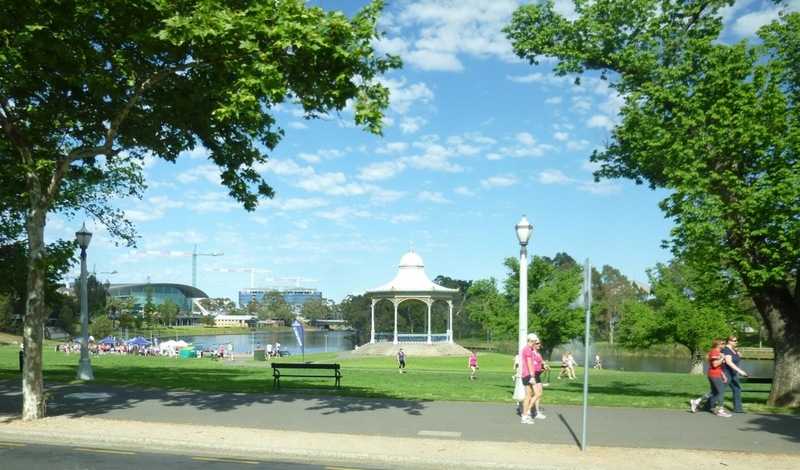 The parks and sports venues around the River Torrens are fabulous and well-used. As you can see from the flock of cranes in this photo, Adelaide is currently upgrading almost all of their sports venues. I wonder if it’s a stimulus project? There is certainly much talk in the country about the effects of the recession – particularly the drop in tourism. 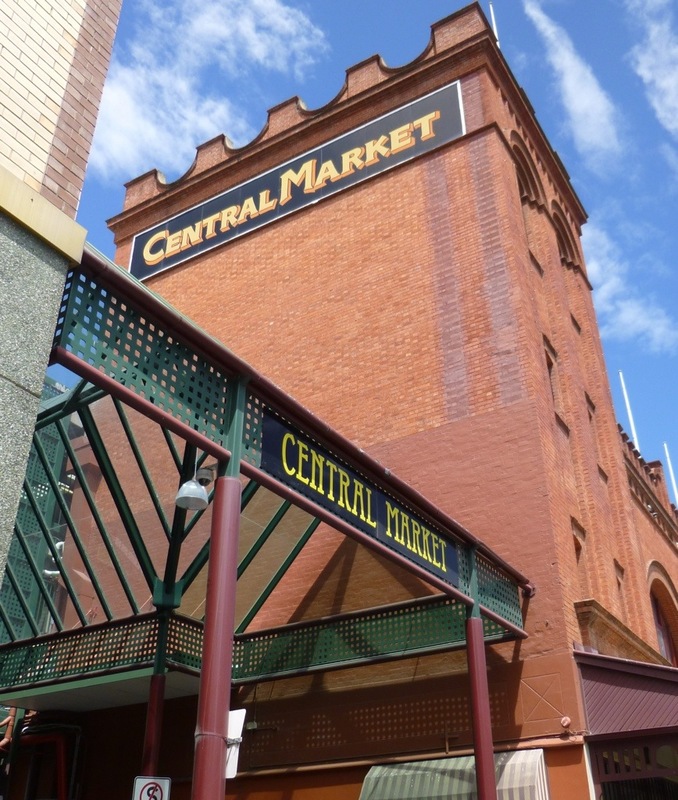 My hotel in Adelaide almost adjoined the Adelaide Central Market – a huge, indoor farmers market that has been a clearing house for local meat, fish, produce and crafts for 140 years. 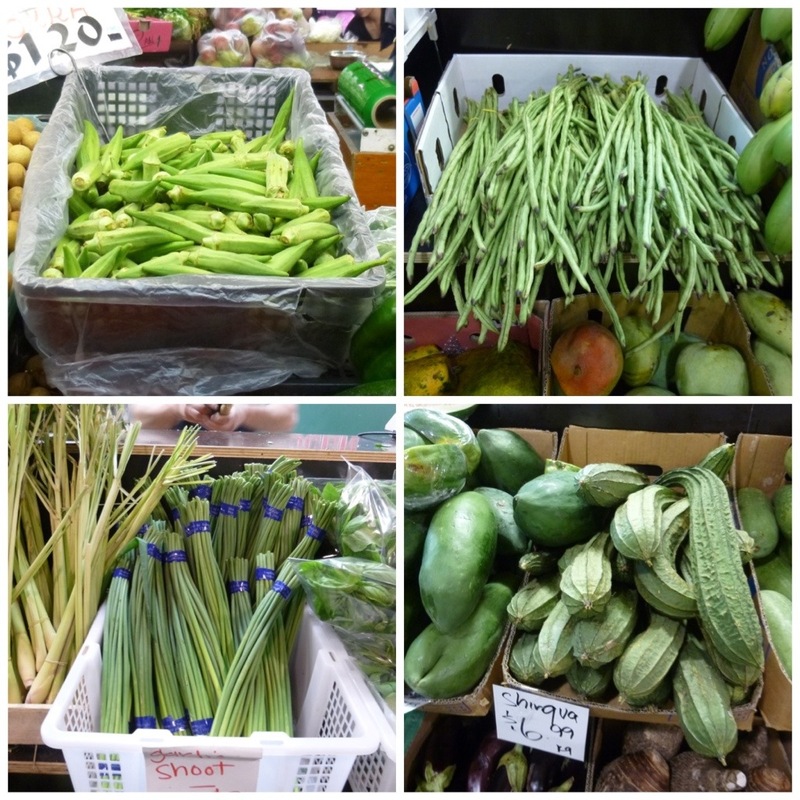 Clockwise from top left – ochra, long beans (I’ll say! ), garlic shoots and something called shirqua. I got a kick out of the varieties of honey offered in one stall. 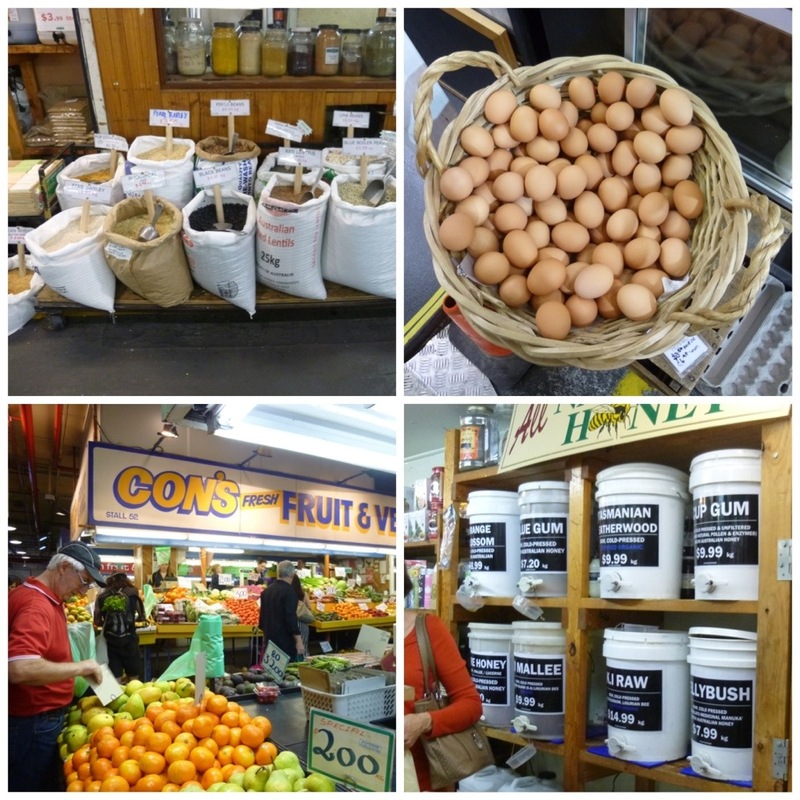 No Blue Gum honey in Canada! There are so many funky cafe’s in the market that choosing a spot for breakfast was seriously taxing. 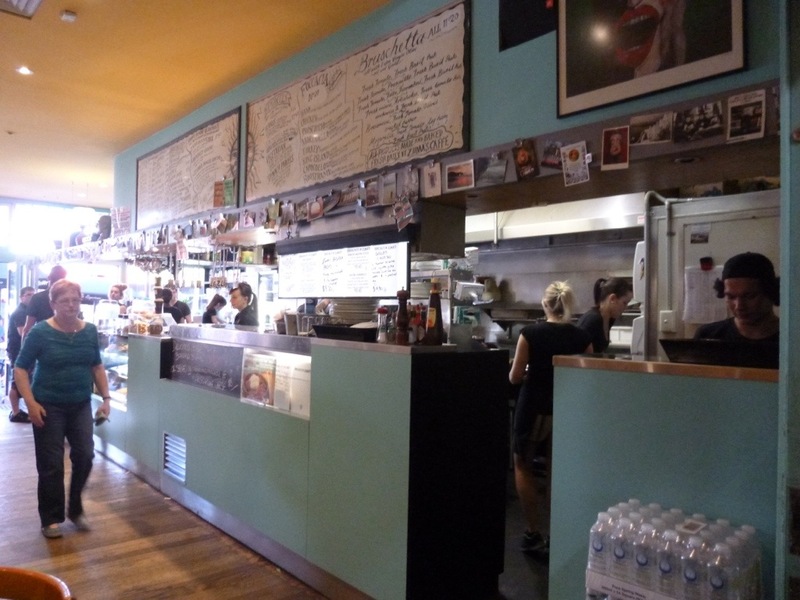 This retro-looking spot turned out to be a very good choice. I’m always drawn to book sellers no matter where I am, and I got a kick out of this totally unorganized collection. It was all I could do not to summon forth my fourth grade lessons on the Dewey Decimal System and start re-arranging the books on the shelves. These happy folks don’t seem to mind the chaos one bit. 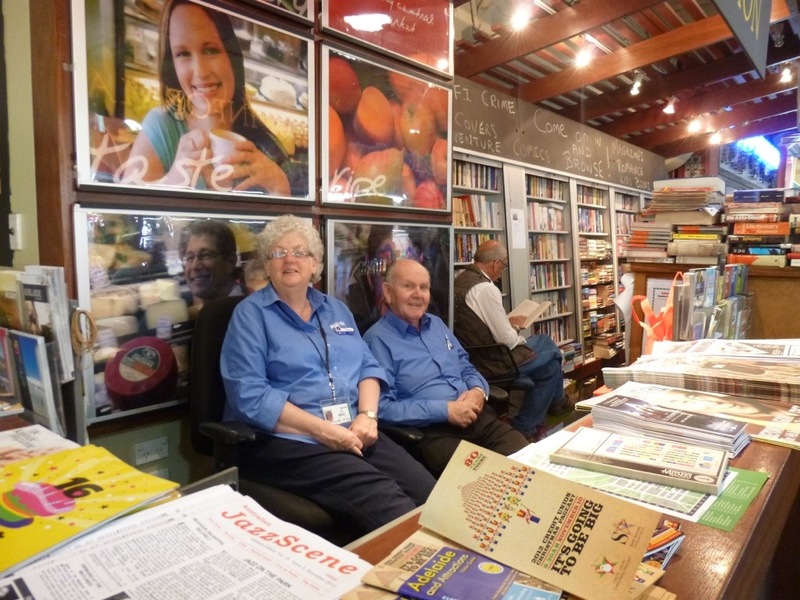 They are the ‘Information Booth’ for the market. 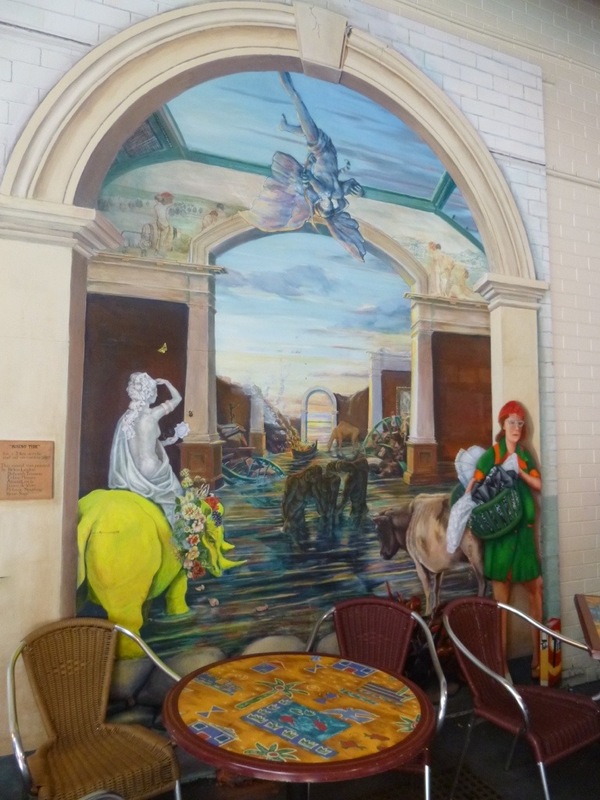 These fabulous wall murals are all over the market but often hidden behind stalls or cafes. This one is called ‘Rising Tide’ and I laughed out loud over the melange of metaphors. 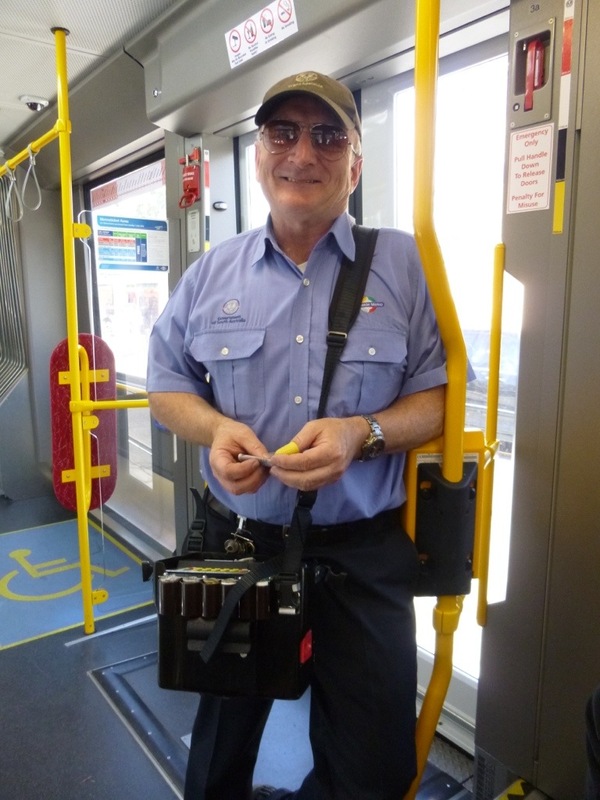 One of my walkabout activities is to jump on a bus or a tram to see where it will take me. 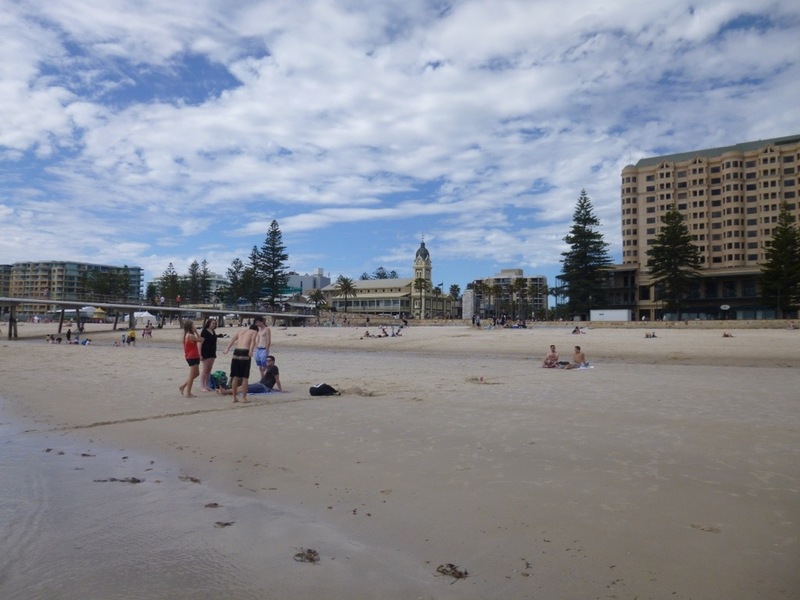 It’s an interesting way to see things that you might not otherwise and on this day I was very happy to end up at Glenelg Beach. It wasn’t warm enough for swimming but it was certainly a pleasant day for a stroll on the beach and I did stick my toes in the Southern Ocean. 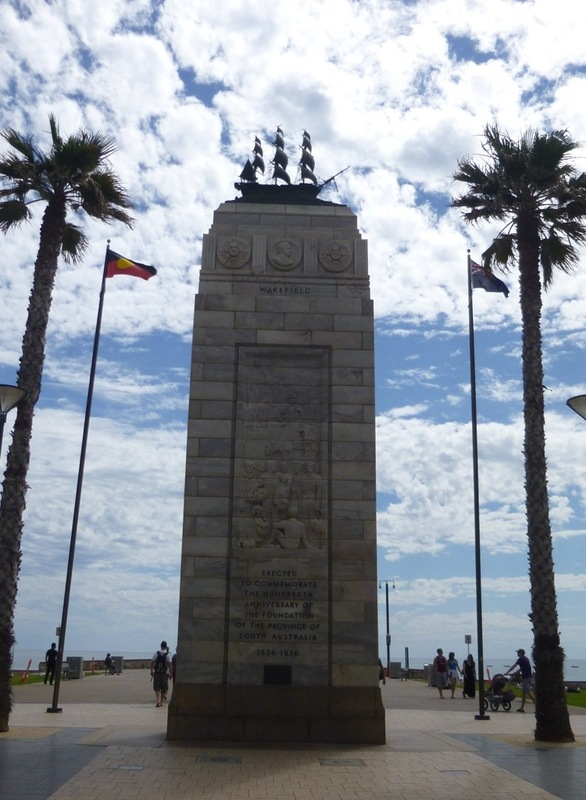 This massive cenotaph at the start of the Glenelg pier celebrates the centenary of the state of South Australia. It made me wonder if they might be suffering from just a tad of ‘small state syndrome’. 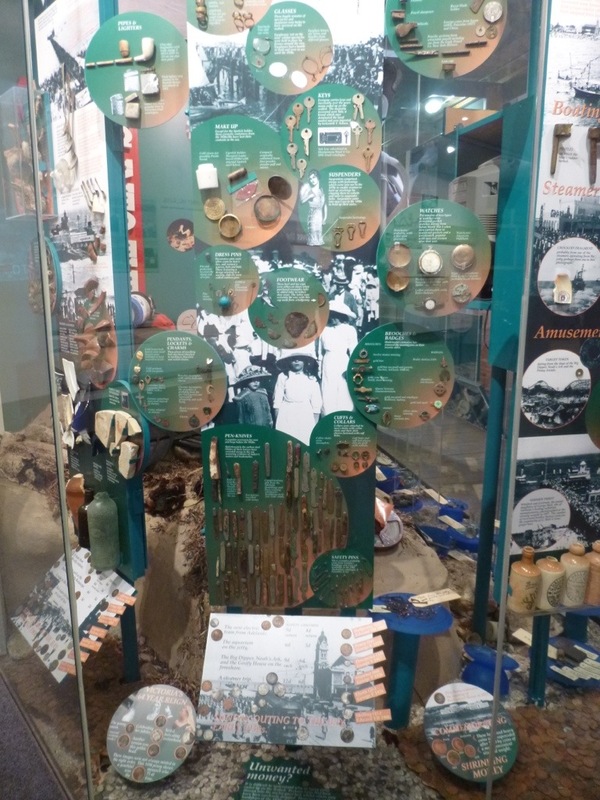 I’ve been terribly impressed with the calibre of galleries and museums everywhere I’ve been, even in the smallest towns. 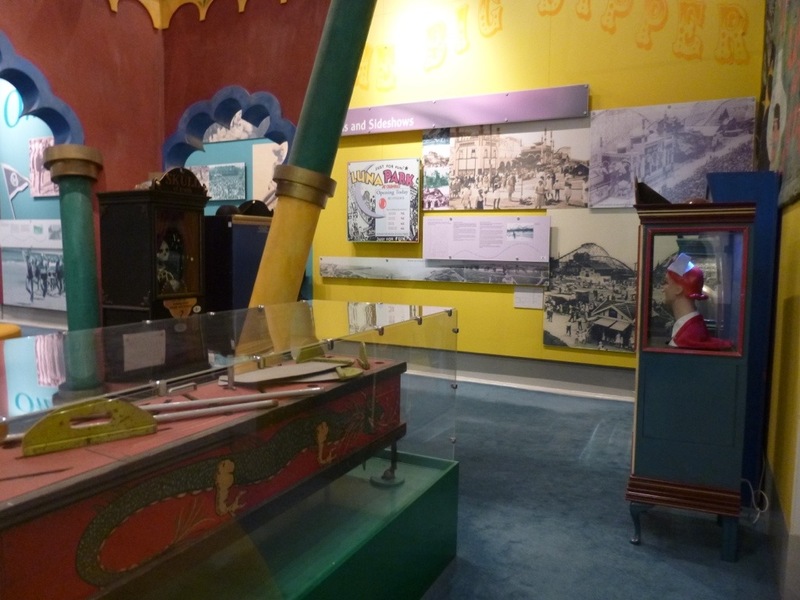 The attendant at the diminutive but very fine museum at Glenelg Town Hall explained that they have to keep standards very high to maintain the accreditation that’s required for government funding. 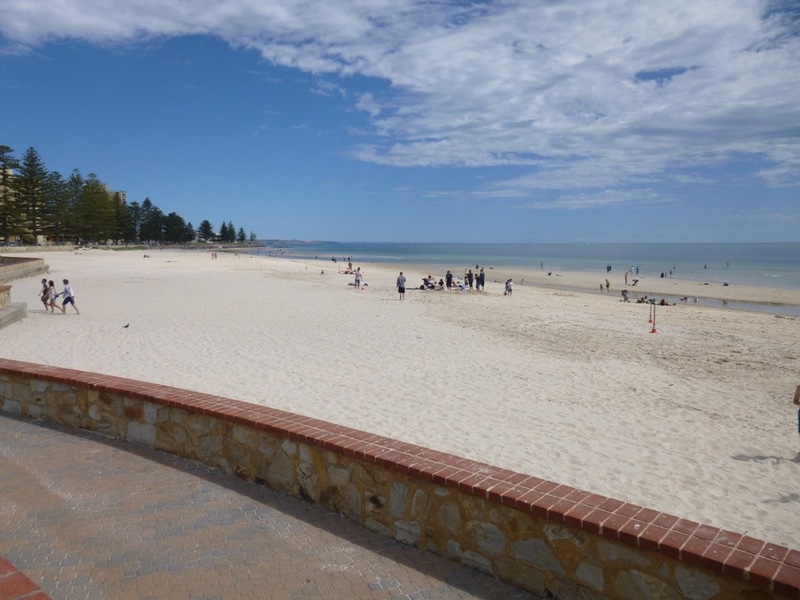 I learned here that ‘back in the day’ Glenelg was sort of a Coney Island to Adelaide, also a center for life saving recruitment and training. 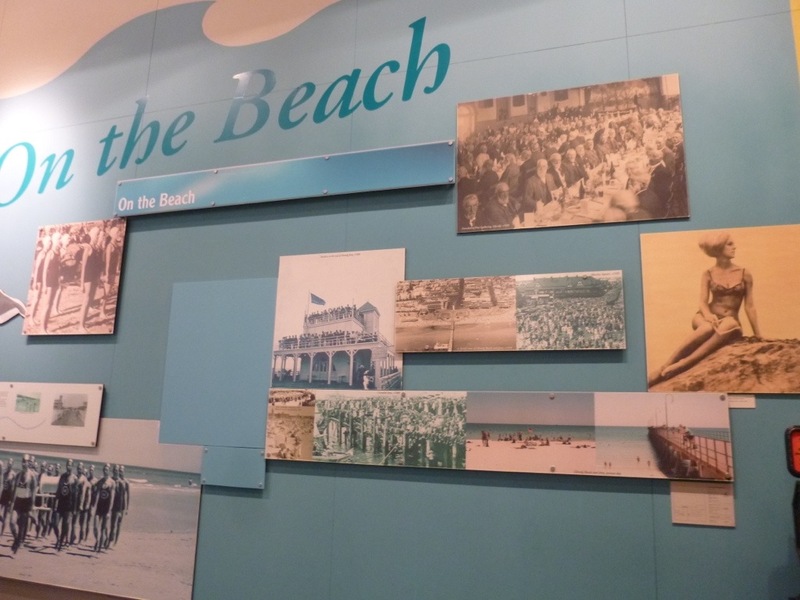 And it’s apparent from the display of nostalgic photos that it was a hub for socialites – a place to be ‘seen’. 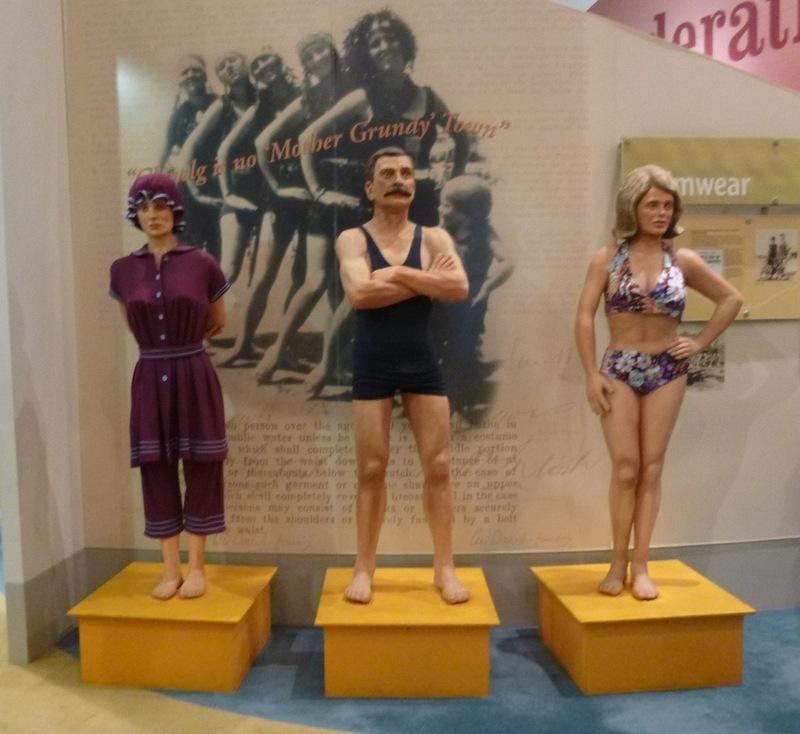 An attractive and comprehensive display of bathing fashions throughout the ages? 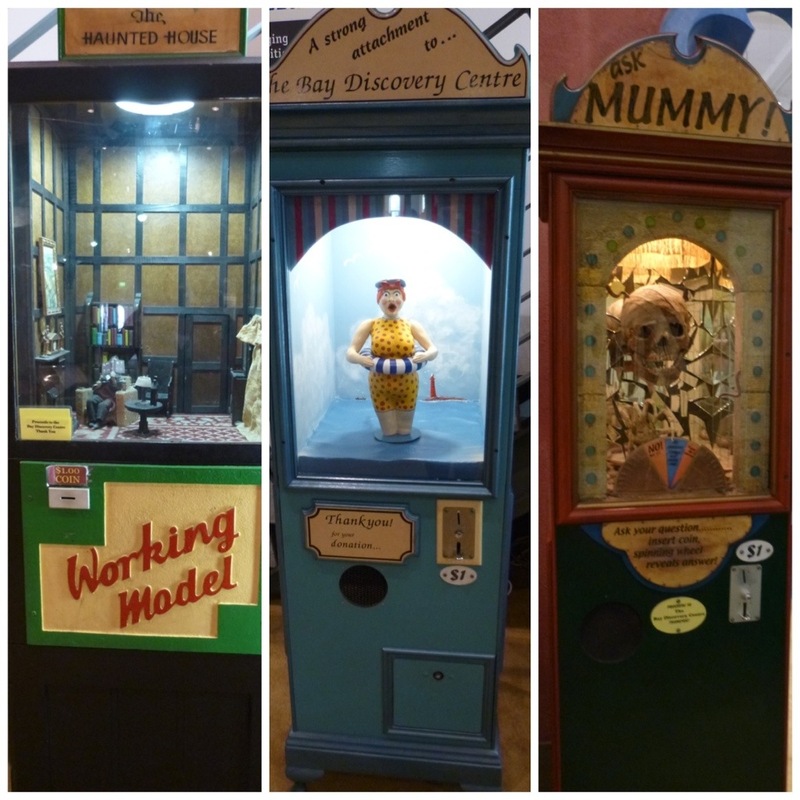 I counted at least five of these fortune teller machines in the display, all in working order. 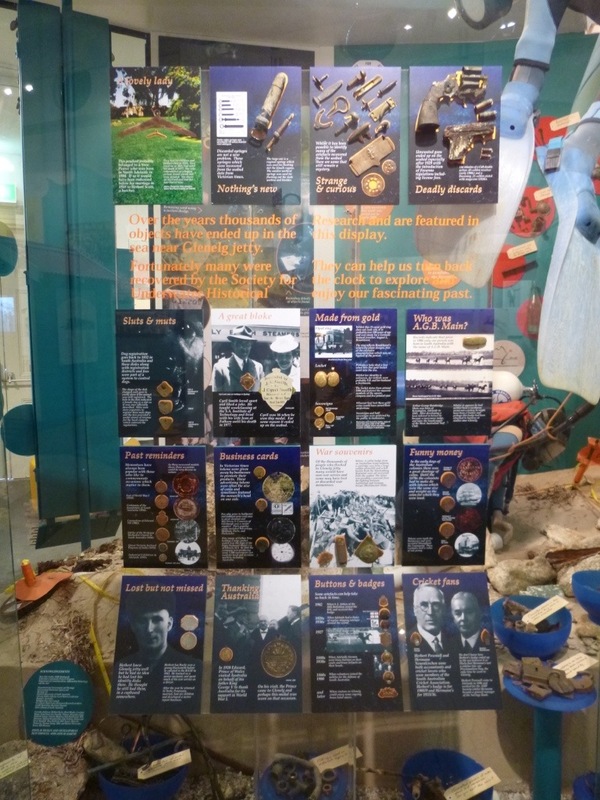 This is only part of a remarkable display of items scavenged or washed up along the beach at Glenelg that includes many pen knives, cigarette lighters, keys, lockets and crucifixes and a very large assortment of service medals. Trams are a serious mode of transport in all of Australia’s major cities and I loved taking them anywhere. The routes are easy to understand, they come along every five to fifteen minutes, they run on quiet and environmentally friendly electricity, and they’re fast and reliable. And they are a great way to view the passing scenery. 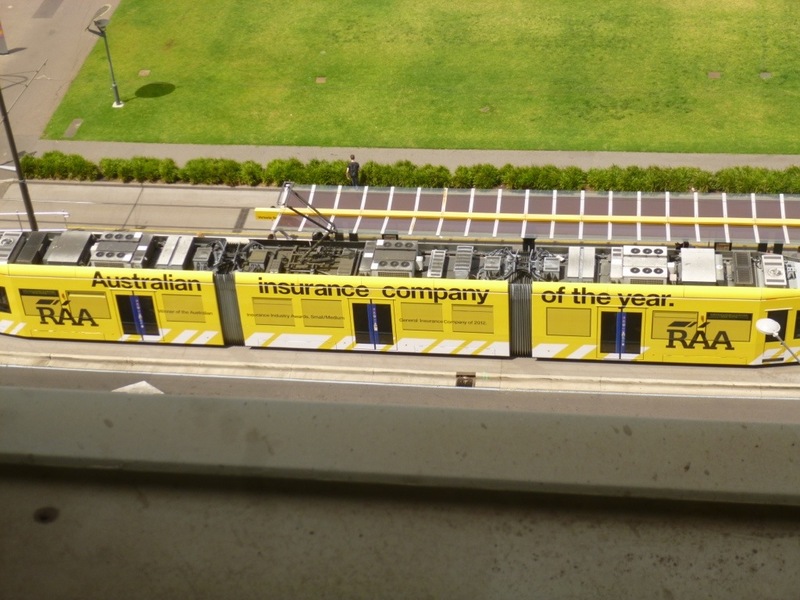 I swear it’s just a coincidence that this particular tram pulled up just as I was focusing my camera. And if you don’t have the correct change – no worries! 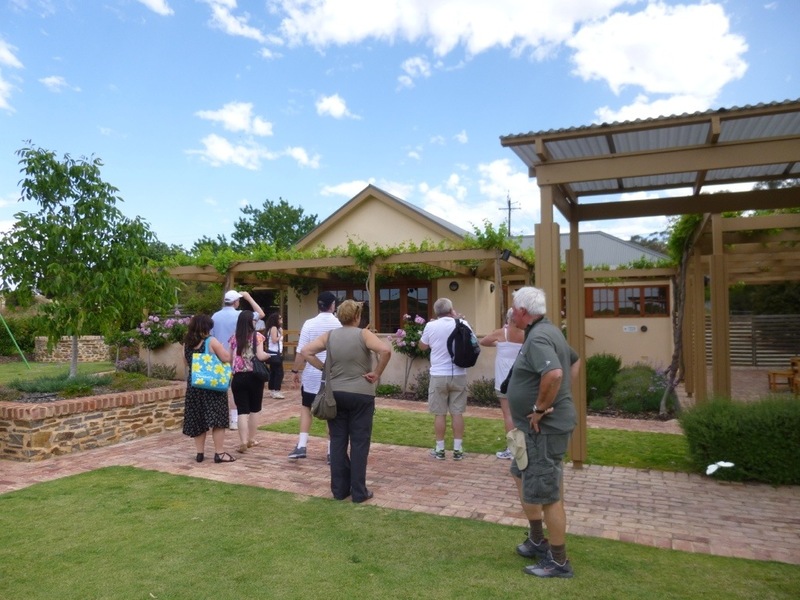 You cannot come to Adelaide without taking one of the many tours of the wineries in the Adelaide Hills. Well, I couldn’t. And not being a fan of massive, refrigerated airplane hangars on wheels I asked the hotel to find me a small-group tour. 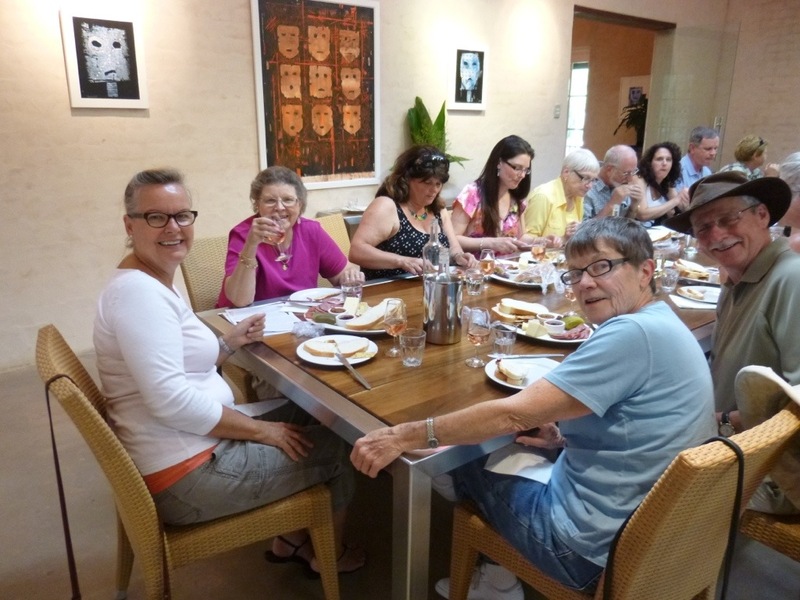 I couldn’t have asked for a nicer time than on the family-operated “Taste the Barossa” tour of four… maybe five outstanding wineries in the opulent Barossa Valley. After the second one..or was it the third?…I lost count. 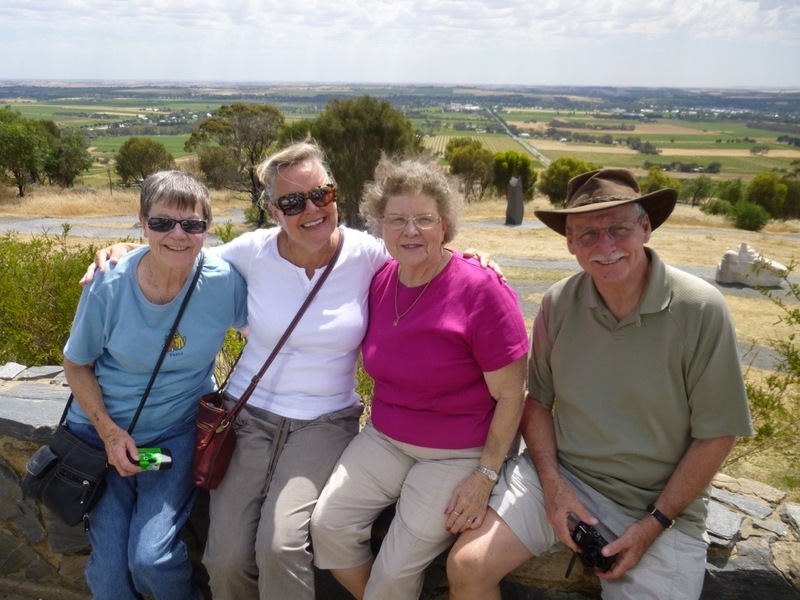 We made a stop as we came into the Adelaide Hills at the Whispering Wall. 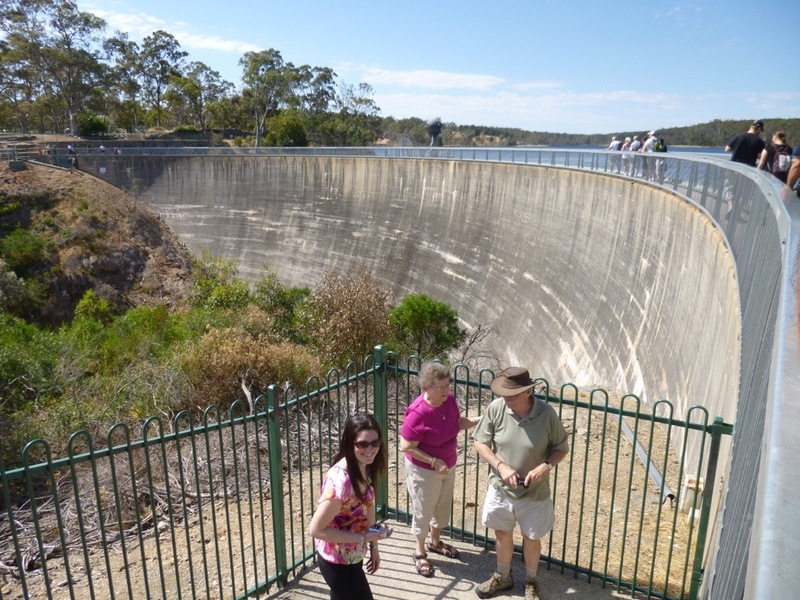 It’s a dam on the river forming a reservoir for Adelaide’s water but the curvature is so perfect and the engineering so precise that when our tour guide, Dallas whispered into the wall way down at the far end of the dam in this photo, our group at the close end in this photo could hear him as if he was speaking on a microphone. It really was amazing. 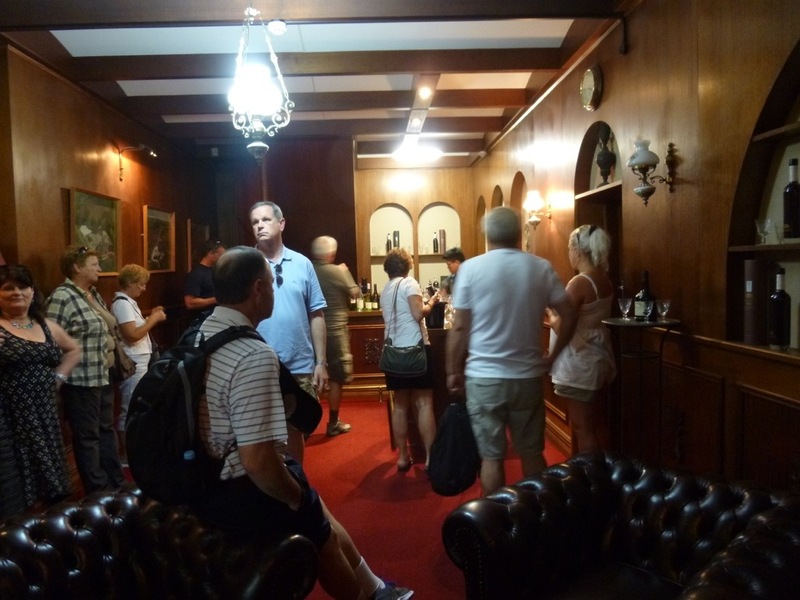 The first, and largest winery we would visit was at Yaldara Estate, owned by the McGuigan family. 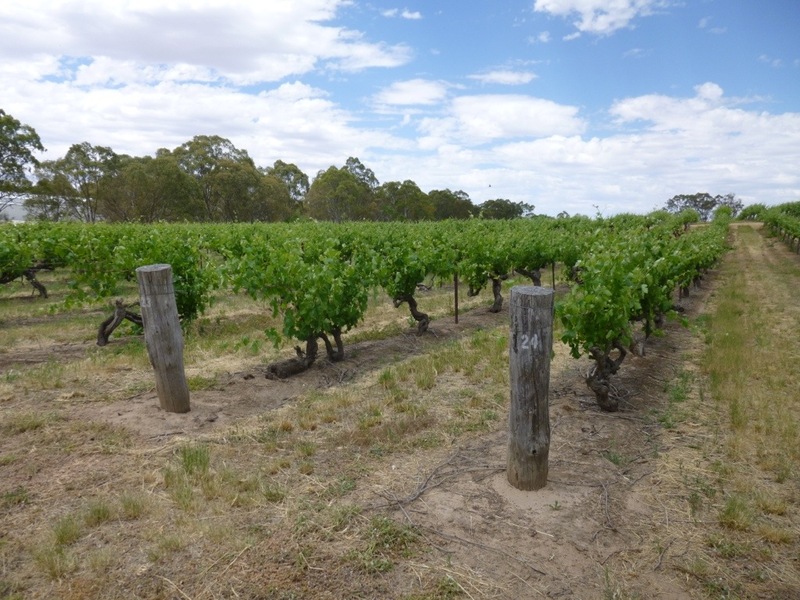 Many fine whites and reds are grown in the Barossa Valley. A grower will plant the variety of grapes that is best suited to the particular location of the field within the valley, and the soil and irrigation can be very different even between adjoining fields. The Barossa is known best for it’s reds, particularly shiraz’ but all of our tastings would include a good assortment of reds and whites. 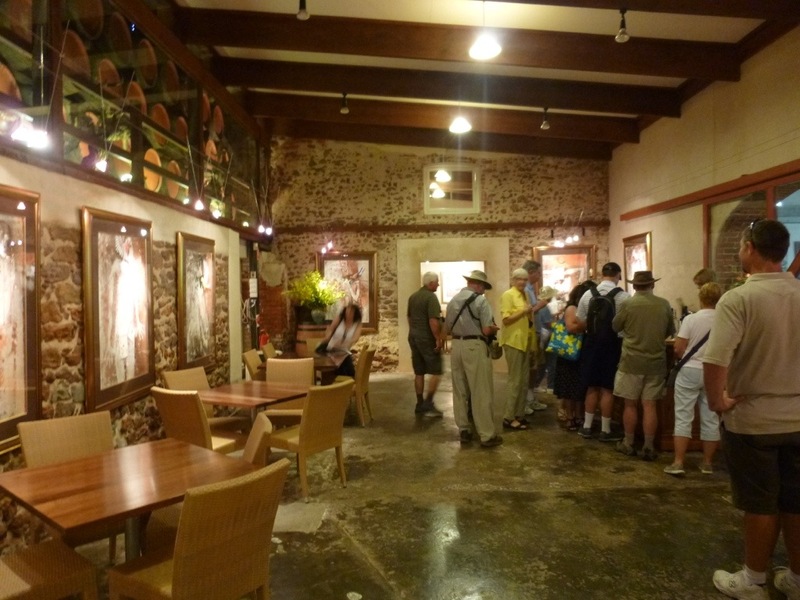 It was lovely to be hustled past the Cellar Door (the Aussie’s term for a winery’s retail store) into cool and comfortable tasting areas at all of our stops. Dallas is clearly very well-known and respected, and we were welcomed like old friends. 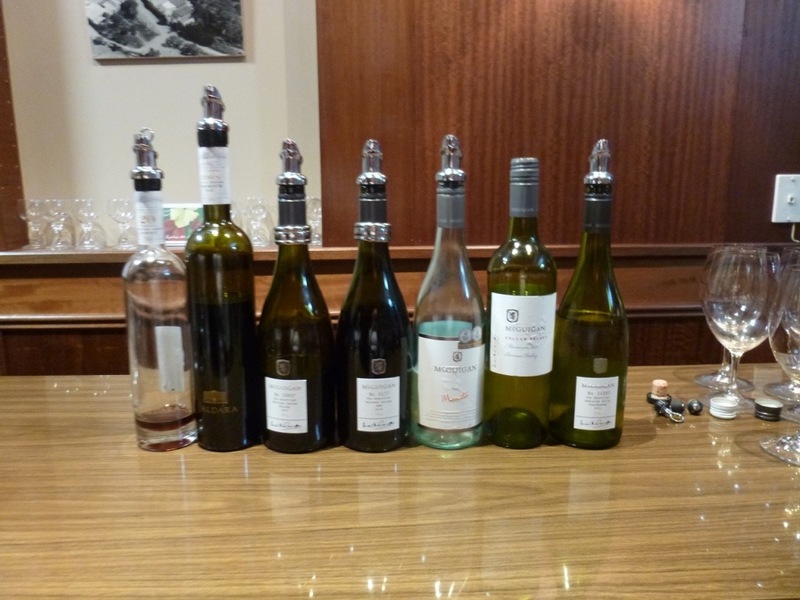 We tasted seven luscious wines here starting with a 2012 Chardonnay and moving through the reds to a rich, sweet Muscato. All quite yummy and served in generous splashes. There are roses everywhere throughout the valley and most notably at the end of almost every row of vines. 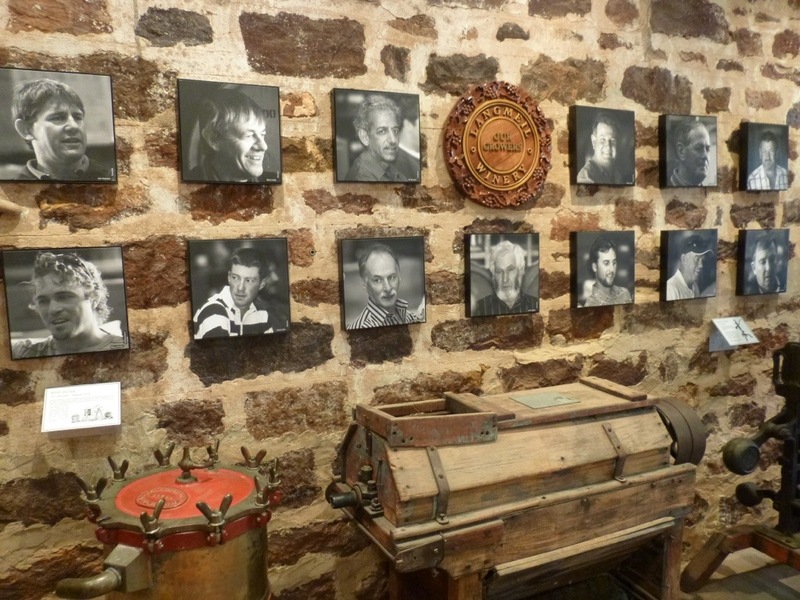 Not just pretty faces, they were a critical component in the business of grape-growing in the early years, acting as an early warning system – the canary in the coal mine. Pests or parasites would typically attack roses first and so warn the growers of any threat to their vines. Modern technology and soil testing techniques have put these beautiful rosebushes out of work but happily they remain and add much charm to the Valley. We had time for a stroll through Tununda on our way through the Valley. 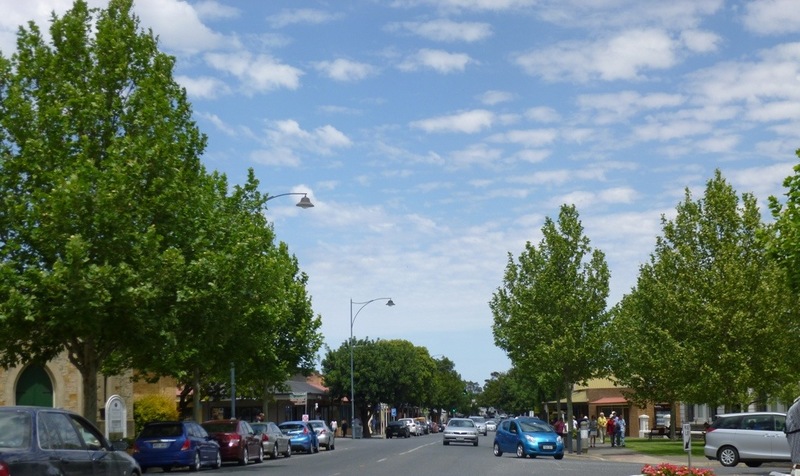 This tiny town is the center of The Barossa and with loads of quaint B & B’s it would be a fabulous place for serious wine connoisseurs to languish for a few days. Tununda maybe be small but it’s large enough to have a world class Town Crier. 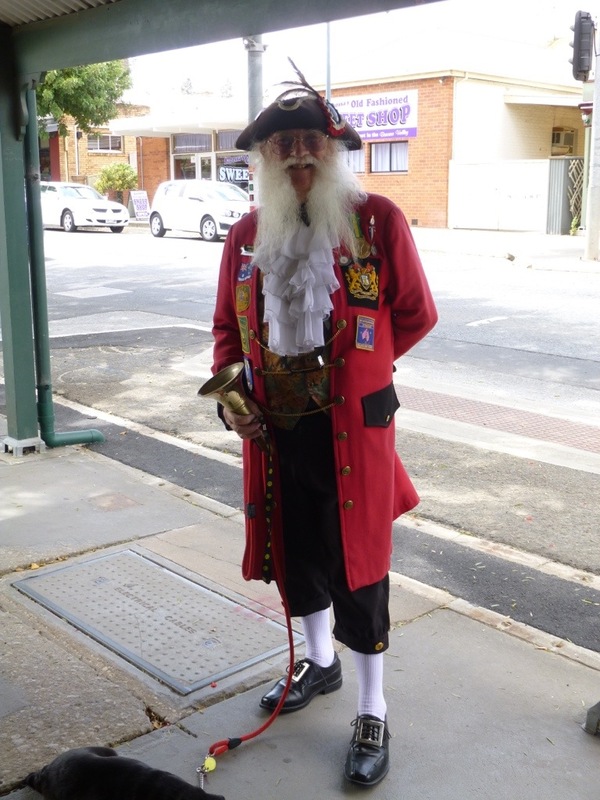 This gent will visit Ottawa, Canada next year to compete in the World Championship of Town Criers. I know I’ll be cheering for him. 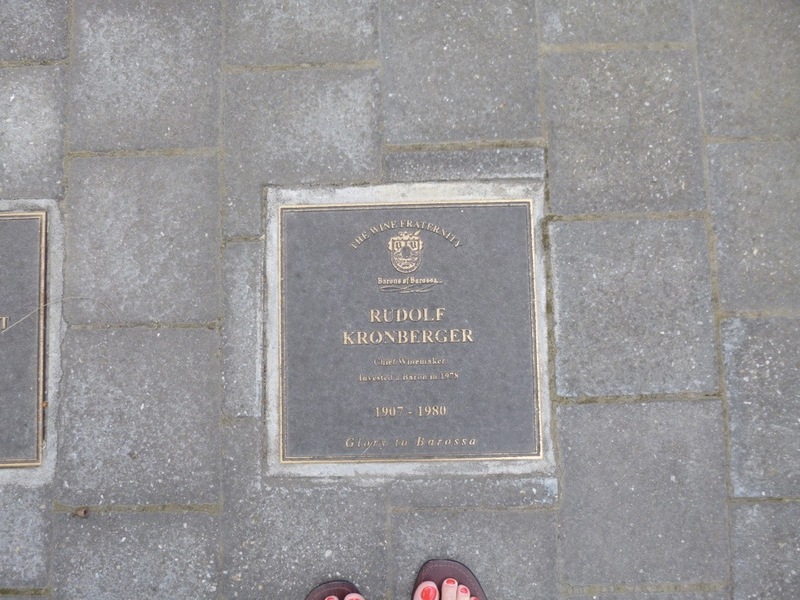 These brass plaques laid in the sidewalk in Tunuda are the Barossa’s version of Hollywood’s Walk of Fame, honoring the best and most innovative grape growers and vintners of the region. Peter Lehman Wines was my favorite stop of the day and not just because we had lunch here. 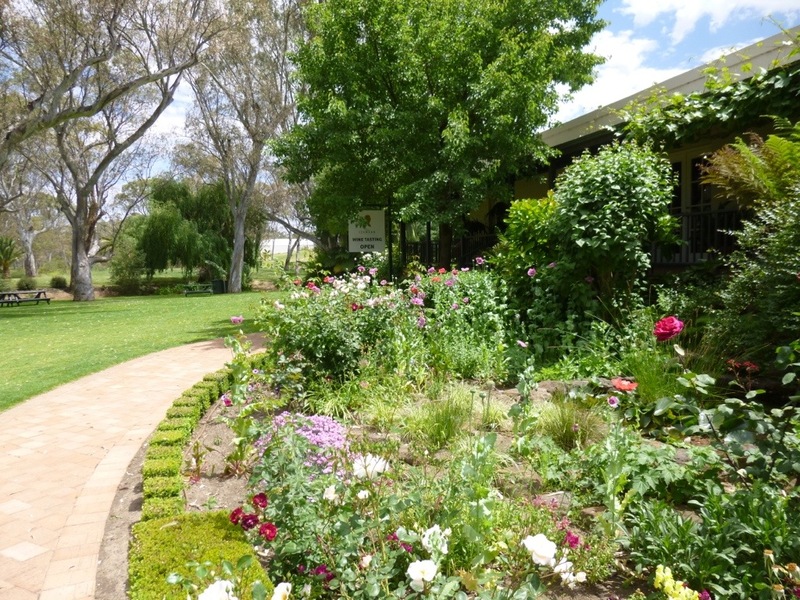 I loved the rolling lawns and beautiful gardens, and the unpretentious looking Cellar Door. The tasting room was also gorgeous and they have a very fine web site. They also had my favorite wine of the day – and the most surprising. 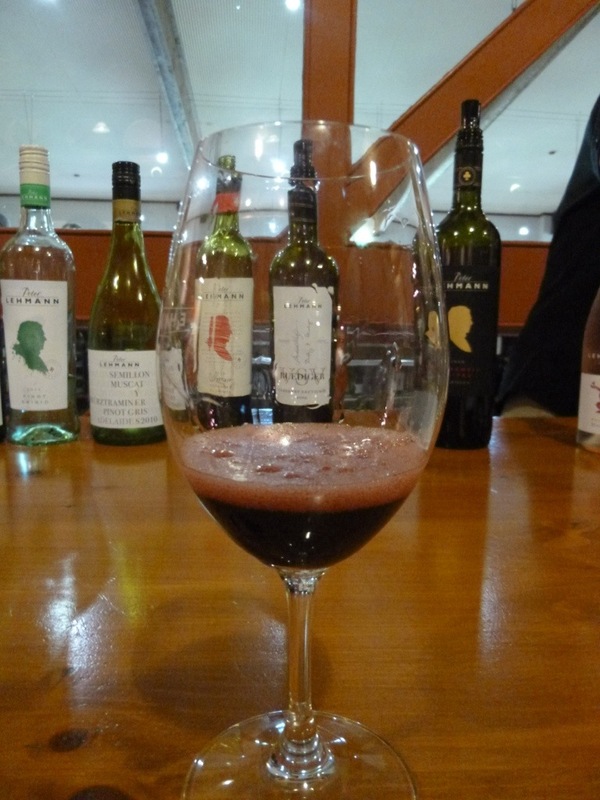 I absolutely adored the sparkling shiraz, and the fact that it pours with a thick, foamy head is seriously cool. Aussie’s drink it by the pailful and irreverently refer to it as “Brekkie Red”. Only Aussie’s would have a special wine earmarked for breakfast. On the other hand I would drink this wine any time. I was also impressed with the story of Peter Lehman and how, when the bottom fell out of the wine business in the seventies, this vintner continued to support growers by buying their grapes on a share basis based on future wine sales. It’s a fabulous example of entrepreneurial innovation and vision that arguably saved the wine business in the Barossa Valley. I had sampled fourteen, or fifteen…or maybe sixteen generous sploshes of wine by now and I was sure feeling it when, in the nick of time lunch was served. Peter Lehman’s put on a lovely spread of breads, meats and cheeses served with local olives and hand-crafted relishes. Ann invited me to join her, husband Jody and sister, Kitty from Georgia for lunch and we had a lovely, lovely chat and giggle. I would have loved to sit and yack with them all day but the next winery was calling…just a short stroll across the lawn. These vines are said to be the oldest in the world at 169 years old. Most ‘old vines’ will be sixty, eighty or even a hundred years old but these are apparently the only vines to have survived a worldwide epidemic of phylloxera that killed off other vines. 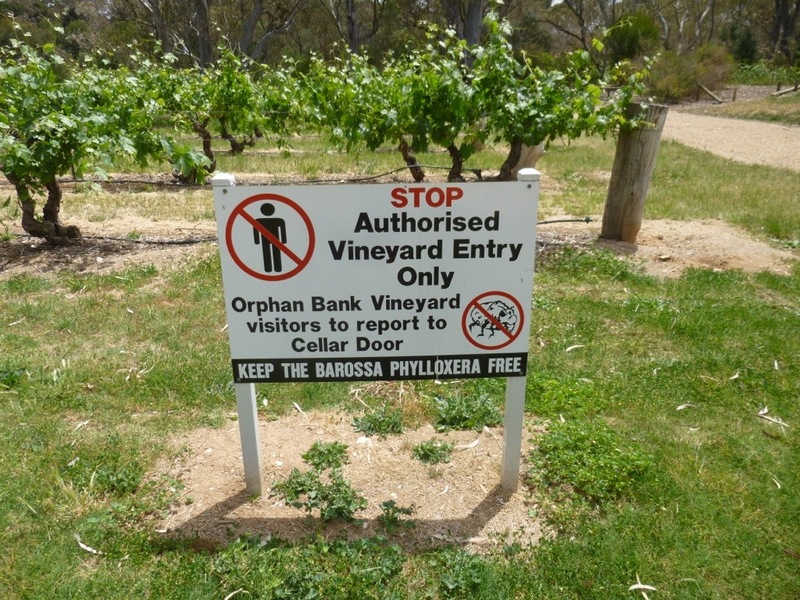 It is violently verboten to tread among the vines anywhere in the Barossa Valley for fear of contaminating the vines. 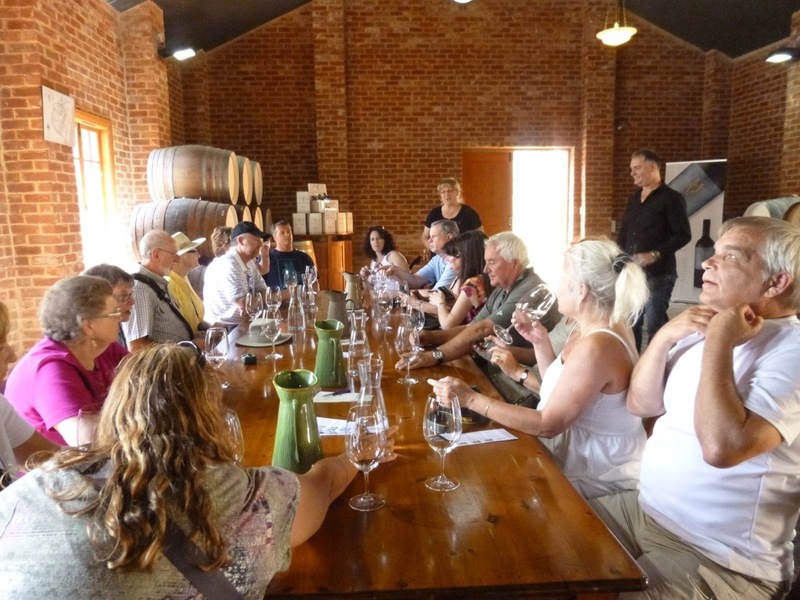 Wine making in the Barossa Valley is a specialist business – the grapes are grown by growers and the wine is made by vintners. There are only a few places that both grow grapes and make wines and that allows vintners to pick and choose the best grapes from selected growers, encouraging competition and keeping the quality very high. 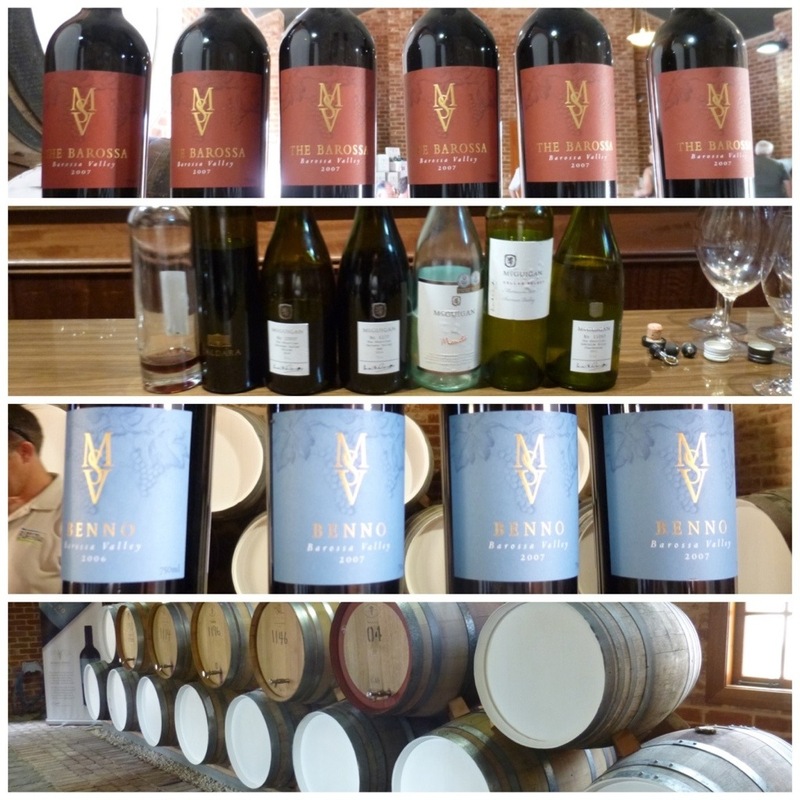 When I started out on this tour my plan was to take a photo of the selections we tasted at each winery. Somewhere along the way I forgot. I think I forgot at the second stop. Maybe the third. 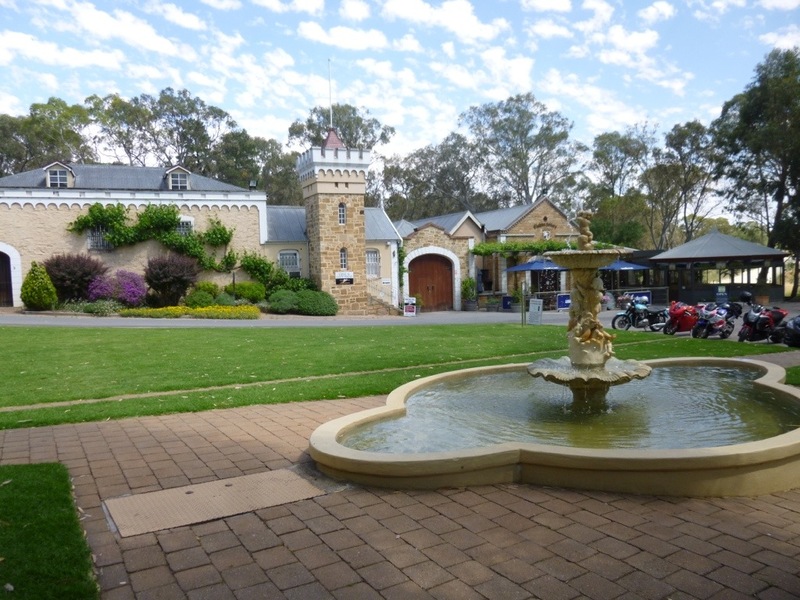 At any rate this is what I recall of the Langmiel Winery which I managed to teeter over to after helping Ann, Jody and Kitty polish off a bottle of muscato with lunch. Winemaking is very much a family business here with often second, third or fourth generations carrying on the tradition. 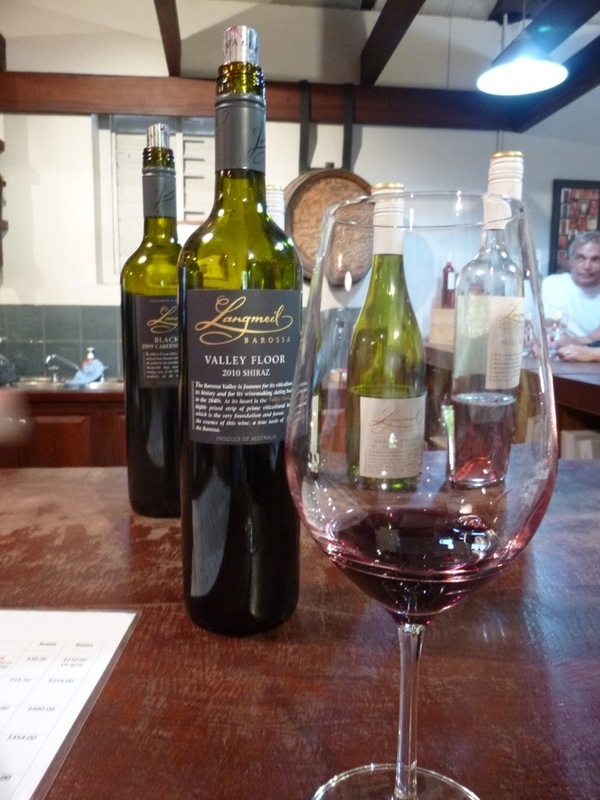 Langmiel is especially known for it’s shiraz. This bottle was listed at around $150 a bottle…or maybe $50. At any rate, I liked this wine. A lot. 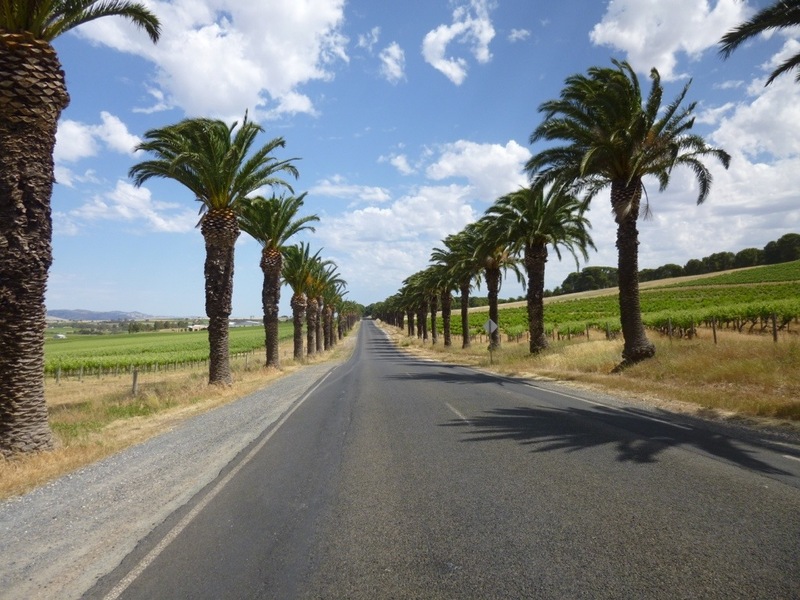 By the time we staggered into Murray Street Vineyards it was getting on to two o’clock and I was feeling a bit woozy…perhaps too much sun. The approach to this property is singularly impressive (I remember that much) as the towering palms that line the fields and driveways can be seen from the other side of the valley. The palms were planted by workers on the estate as a tribute to a previous owner. I can’t quite recall why but I think it was a lovely story. It’s all a bit hazy. I do recall that this winery had the nicest – and largest – wine glasses of them all and their tasting portions were similarly generous. I probably should have tossed in the towel by then but I thought it would not be polite. And I couldn’t resist the delightful ‘Benno’ and ‘Sophia’ shiraz wines, a tribute to the grandparents of the current vintner. And they were indeed tasty. The white barrels are port and we were lucky to get an extra treat here – a touch of tawny. Yummah! 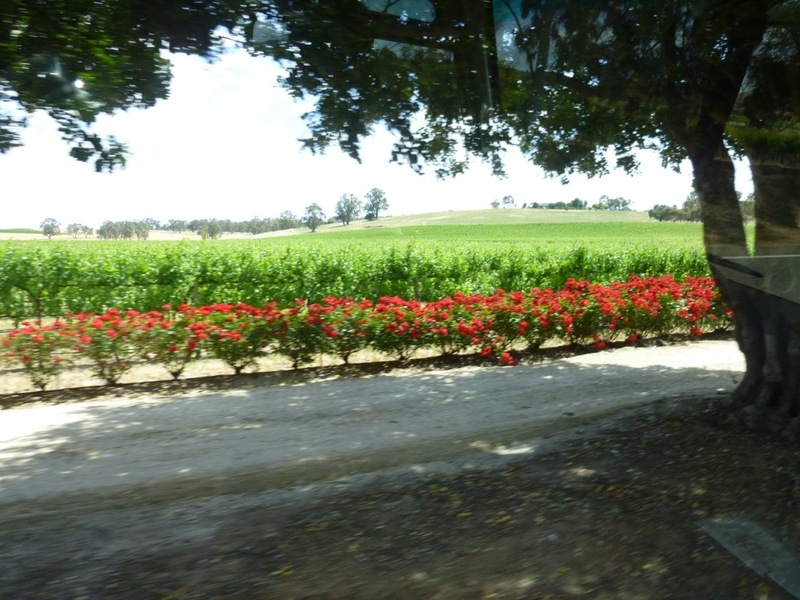 This is our last view of the lush and delicious Barossa Valley. I don’t remember having this photo taken but I was quite delighted to find it on my camera the next morning. These were absolutely wonderful and friendly folks. We got closer and closer with each stop so I’m very glad to have this lovely memento. 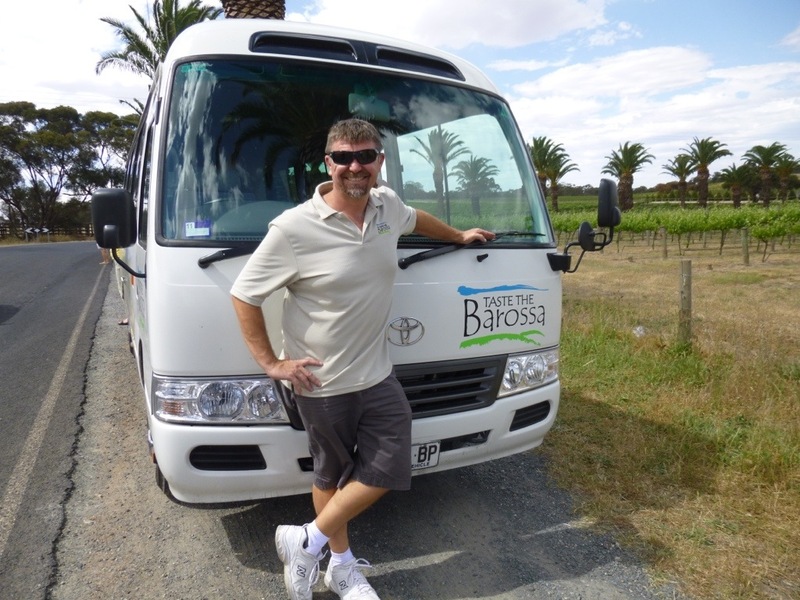 I can’t say enough about Taste of Barossa Tours and owner, Dallas. He is not only knowledgable but absolutely passionate about his valley. 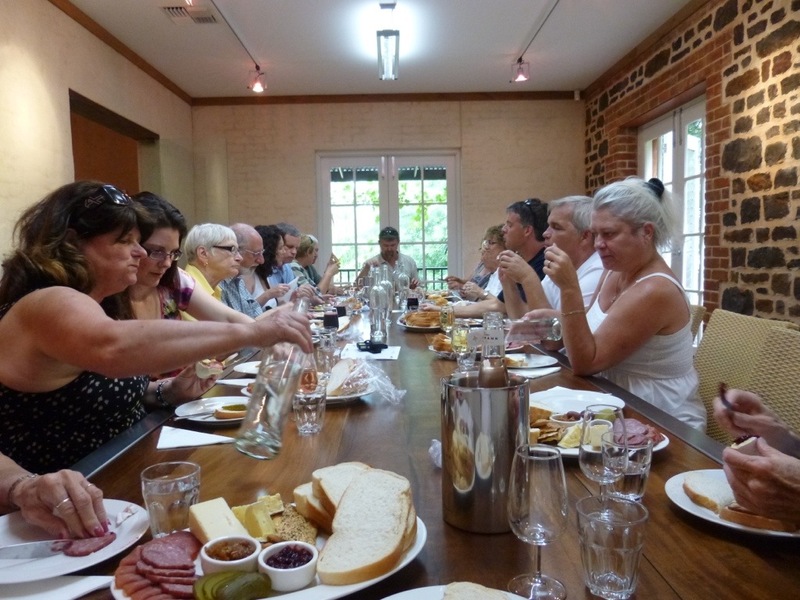 There is no better way to taste the Barossa. I think I went to bed early. Probably because I had to get up early next morning to catch The Overlander to Melbourne. Yes, that’s it. Take your time Terri, you so deserve it. Lamka ne sab sab nang go, careful on the way. 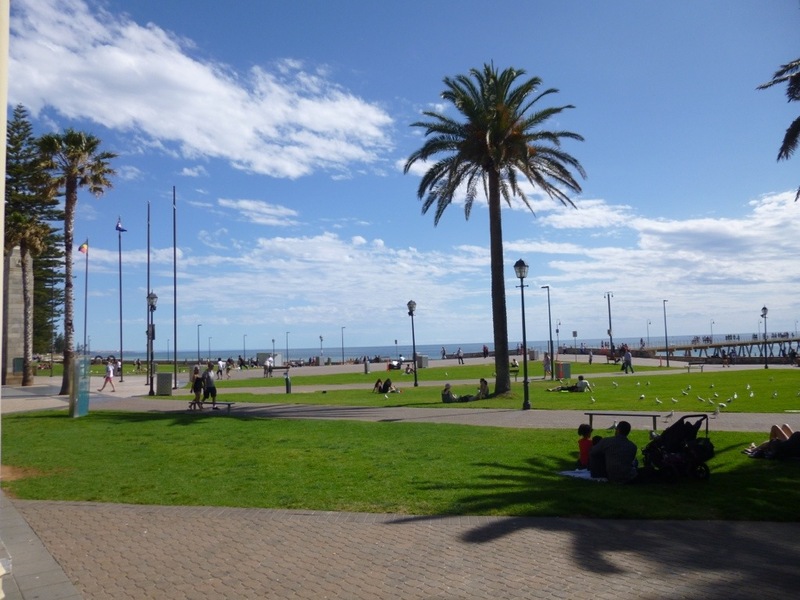 Thanks for finally writing about >An Adventurous Broad Abroad – Laid Back in Adelaide | WeStCoaSTGiRL <Loved it!